The Mizu Insulated Titanium Mug gives you the benefits of a double-wall mug without the weight. 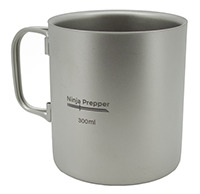 Our high grade titanium alloy provides a durable insulated mug at under 100 grams. Designed by Ninja Prepper, a family run business based out of central Washington state. The Mizu mug is an insulated titanium mug. Its double-wall titanium construction keeps your drink warm, but more importantly, it keeps the outside of the mug cool to the touch even with boiling liquids inside. Single wall metal mugs will easily burn your hands with hot liquids inside. The light weight and extreme strength of this mug allow you to store it easily in your hiking or bug-out bag, while still being large enough to enjoy a full cup of coffee. The handles on the mug collapse flush against the cylinder for storage and can be folded out while in use. The mug measures 3.25 inches tall, and 3 inches in diameter. Similar in size to a standard diner coffee cup. The weight is 97 grams (or 3.4oz). 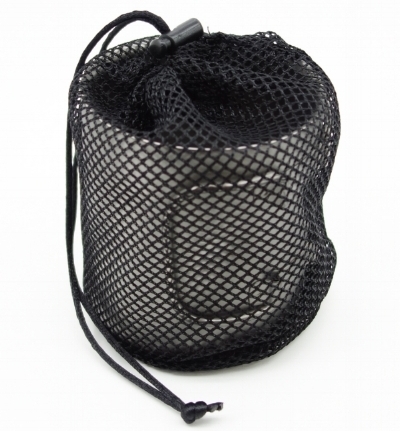 All Mizu mugs now ship with a drawstring mesh bag which keeps the mug from clanging around in your bag. Ninja Prepper is a participant in the Amazon Services LLC Associates Program, an affiliate advertising program designed to provide a means for sites to earn advertising fees by advertising and linking to Amazon.com.